I’m super excited right now because I solved a problem that I didn’t think would have an easy answer. No, not running Flash sites on a Raspberry Pi, although I do think that is solvable too. 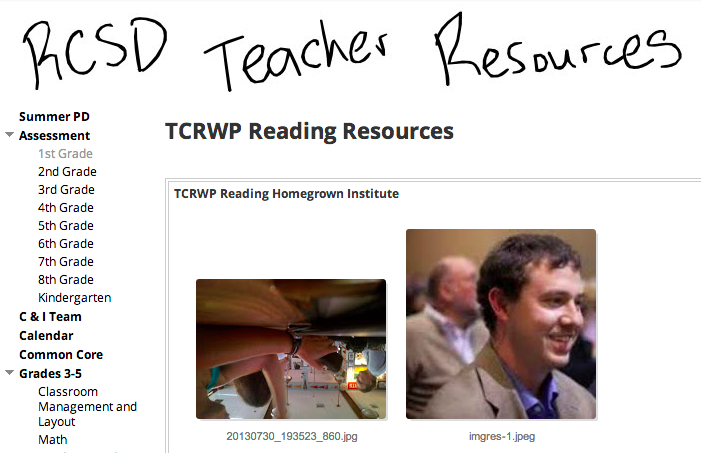 We wanted to be able to allow teachers in our district to share resources from the TCRWP Homegrown Institute in the Teaching of Reading with everyone else, without making everyone join DropBox or go through the unfortunate hurdles that sometimes appear when logging into their GAFE account. A little research and tah-dah… EntourageBox to the rescue! What is EntourageBox? Well, basically they create the ability for anyone to upload to a specific Google Drive, DropBox, or S3 Bucket (don’t yet know what that is) folder via a weblink. I chose “Google Drive”, which brought up this next prompt after asking me which Google account (I was signed in under two accounts in Chrome) I wanted to use. Now all they have to do is click “Add files…”, choose the files, and click “Start upload”. I believe they don’t simply start uploading because they want to make sure you’ve selected all the files and they could be from my folders on your hard drive. All the uploaded files are then accessible with the same link, or they can go to our district’s Teacher Resources page where I’ve set it up to automatically show all the files within the Google Drive folder I created. Wow. I was so excited I just stopped eating my dinner for twenty minutes so I could share this with all of you. I hope you enjoy it as much as I do! This entry was posted in Uncategorized and tagged How To. Bookmark the permalink. 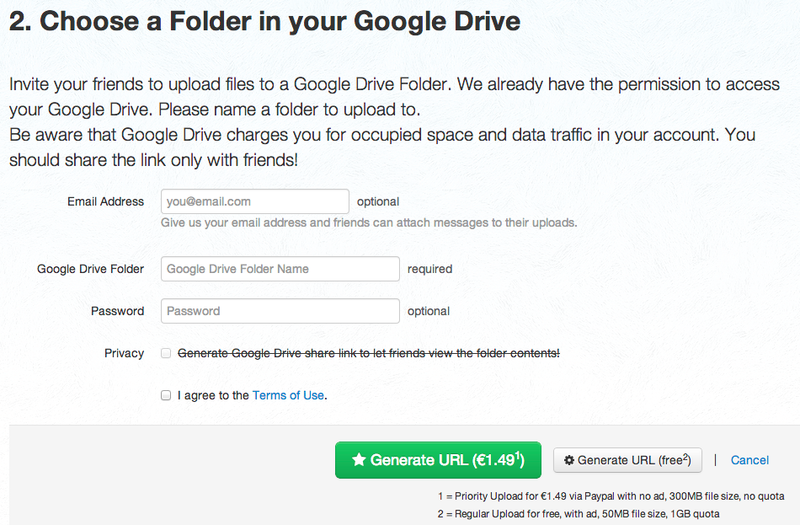 13 Responses to Allow others to upload to your Google Drive without a Google Account! This is great! I was just thinking about this the other day. Thank you for sharing. Thanks for that info! I think that’s actually what a couple of the companies we use in our district use as their backend. What a great resource. Even if you are sharing documents, the free option seems logical in many cases. If you purchase the link, do you have any control over what the link looks like? (Ie is it customizable?) and does it last for any specified period of time? Yes, the free seems useful for most needs, unless you want items uploaded quickly. As far as the purchased one, there isn’t any customization available that I’m aware of and I’m not sure about how long it lasts, although it gives me the option to delete it. Very cool. After thinking about it some more, I’m sure that most using a feature such as this would have a blog to simply post the link. Even a bitly as someone mentioned or 301 redirect to make a nice link such as https://elementaryedtech.com/upload would probably do the trick. Will definitely keep this option in mind for those who may need it! Sounds just like http://dropitto.me/ which I have experimented with. This is better because you can choose your cloud storage rather than only dropbox being available. Thanks for sharing! I would be interested to see an update in the future of how it worked out with teachers. Hi Michael… Yes, very similar. As far as how it worked for teachers, it looks like only two people have used it so far. Not sure if the link wasn’t shared with everyone or if something happened. Thanks! Very nice! I’m interested in whether the link is customizable, as someone earlier asked. Also, what anyone thinks about incorporating this somehow for student friendly uses. Thoughts? Anyone? Bueller? No custom link, but you could make a custom bit.ly link perhaps? Thank you so much for sharing! I’ve been working on a solution for my online course participants to turn in completed assignments. This makes it easy! Thank you! Thanks for this post. Exactly what I was searching for and a cinch to setup.